This book has primarily been about the role played by the UN family over the past 25 years in the promotion of quality education for all, the type of education that empowers individuals, groups, communities and nations, enabling them to assume control over their own destiny and to build the foundations for a more peaceful, just, equitable and sustainable future. 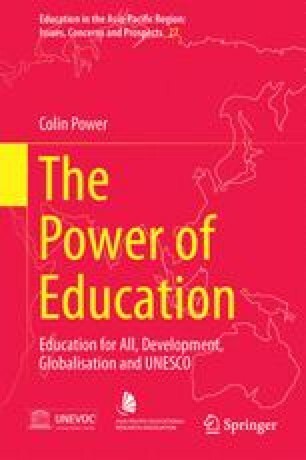 It seeks to demonstrate that despite its weaknesses, the UN system (and particularly, UNESCO) has played an important role in the development of educational policy at the international level, in promoting education for all and in facilitating the international co-operation needed to tackle the global challenges facing education systems at the dawn of the twenty-first century. Three passions have governed my life: the longing for love, the search for knowledge and unbearable pity for the suffering of mankind. Lewin, K. (2012). Revisiting the internationally agreed goals for education. Presentation to 18th CCEM, Mauritius (www.create-rpc.org).